Wash your panes with a new cleaning method that has met the requirements of over 94% of our clients in Walworth! A: We can swiftly remove smudges with either outer window cleaning (for four-storey properties), rope access window cleaning (for high-rise properties), or via the common manual cleaning of interior panes. Q: Can you explain me a bit more about your water-fed pole cleaning approach? A: Of course! This gear can expand up to 22 metres in length, allowing the cleaners to effortlessly reach and clean even the most distant corners of your panes. A: Our water is purified from any residue-causing minerals. When this water evaporates under the sun, it won't leave any streaks behind. A: Rainwater is usually dirt-free, so it won't stop us from doing our responsibilities. However, while we won't mind a slight sprinkle, a sudden cloudburst can lead to unsatisfying results. During thunderstorms, we may have to delay our service for a day of your preference to ensure the team's safety. 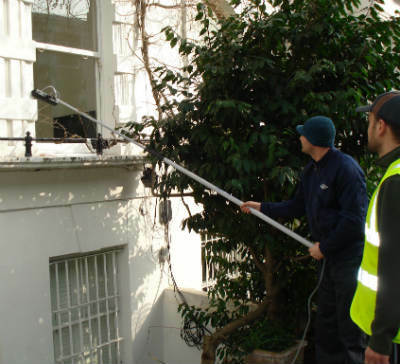 A: No, the practiced window cleaners in Walworth can easily perform external window cleaning while you are away, as long as your property gates are unlocked. And if you want your windows to sparkle on the inside, just book our complimentary key pick-up and delivery alternative instead. With window cleaning in Walworth, you'll give your windows the professional clean they deserve... at custom-tailored price rates that will stay within your budget! Don't believe us? Scatter your doubts by consulting our price table below. With window cleaning in Walworth, we can increase the appeal of your property even if it touches the clouds above. Let's look at what you'll get once you go for our custom-tailored service. For external window rinsing, the Walworth window cleaners will make use of a extendible water-fed pole. A water pump inside the cleaners' van will pump filtered water up the hose and out of a brush-head add-on. The water, together with the brush-head, will remove any traces of dust from the panes of any four-storey domain. With rope access window cleaning, the experts will use reliable abseiling gear to reach even the topmost floors in your commersial or home property. We have all necessary COSHH documentation and risk evaluation reports and can send them to you as soon as you need them. In addition, we frequently check the washing gear to ensure that your session will go without a hitch. And to dight every inner corner of your window façade, the experienced team will use the classic squeegee and ladder cleaning method. We are happy to report that our window cleaning in Walworth has been booked by several bordering regions as well. You can see which locations we cover below. Another quick and easy way to get a free instant quote or to book window cleaning services Walworth SE17 is through our web site.